Vashu Bhagnani’s "Himmatwala" is a new project for Sajid Khan and he released first look of "Himmatwala". "Himmatwala" is a remake of Jitendra and Sridevi starred movie "Himmatwala"(1983). 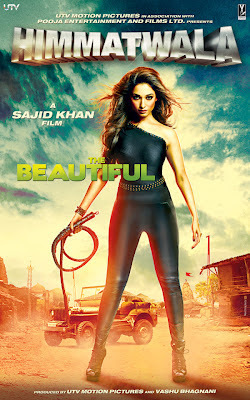 Sajid Khan also in search of new face for a lead actress role and finally she get a new and fresh face for bollywood and the lucky girl is "Tamannah Bhatia" against lead actor "Ajay Devgn". Himmatwala may be released on 29th March 2013. IPL is the best time for Sajid Khan as her last two movies Housefull and Housefull 2 both are released during IPL. Actor Ajay Devgn today released the first posters of his much-awaited film "Himmatwala" on twitter. In this poster 1980;'s charm created in both actors and tamanna bhatia will play role same as sridevi had done in original movie. 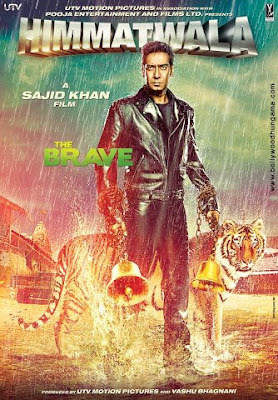 "For all of you who didn't get to see it yet, here's the first look of my film with Sajid!,"
Ha ha ha ha... The poster looks funny to me.East or west SRK is the best.